The full event programme (with full timetables and lists of speakers, comedians, musicians, stallholders and caterers) will be released in October 2018 on this page here. Advance tickets are now available to buy on this page here. Please see this page here for full information on getting to the venue. A map showing how the different halls of Olympia London are connected is shown below. We have a limited number of exclusive hotel deals for attendees of this event. These special offers can be booked by telephone or online via HotelMap on this page here. Should you have any questions on hotel bookings via HotelMap, please email Assistance@HotelMap.com or on +44 (0)20 7292 2335. NOTE: Hotel costs are not subsidised by the organisers. Parking is NOT included in the ticket prices – this needs to be booked separately by visitors. 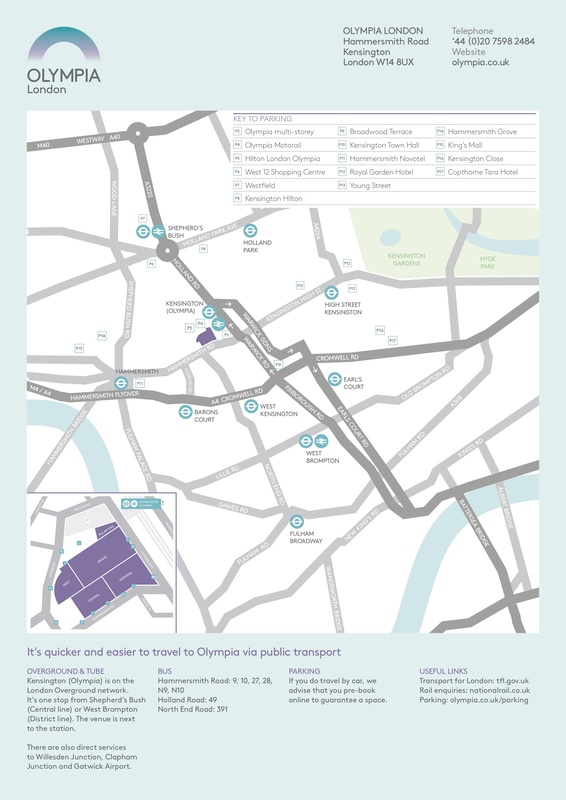 Olympia London has two public car parks - they are indicated as P3 and P4 on the map here. P3 is a multi-storey car park with 380 spaces (height restriction of 2 metres). P4 is a flat-surface car park with 175 spaces (height restriction of 4 metres). For other parking options nearby, follow the link here. Both the Blythe Road and Hammersmith Road entrances are well served by taxis. Click here for facilities and measures put in place to ensure that visitors with disabilities have a pleasant time at the event. Cloakrooms are available in Olympia Central Levels 1, 2 & 3. There is a small charge per item stored. There are ATMs in the main entrance foyers of Olympia Central and West and on Level One of Olympia Central. A NatWest cash point machine is located on Olympia Way, opposite Kensington (Olympia) station. Branches of major banks with ATM's can be found on Kensington High Street. The venue provides a free Wifi service which is not secure and is only suitable for casual browsing of data or social media posting, rather than streaming of large amounts of data. If you require a secure broadband for the duration of the event, please email the venue's internet suppliers EForce at sales@eforce.co.uk for an order form, and return it to EForce by September 28th 2018. Internet is charged per device. If you need internet on more than 1 devices, please book more than 1 connection point using the order form at the link above. Also make sure that your devices are up to date before use at the venue. 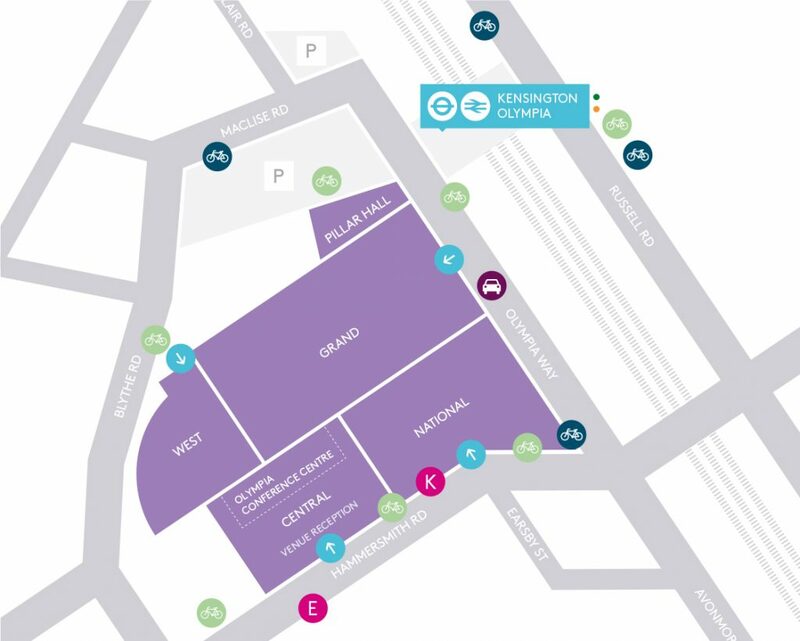 The venue's Medical Centre is located in Olympia Central Level 1 and is clearly signposted. Toilets are readily available across the 4 halls used by the event - see the venue floor plans for locations. All separate, accessible toilet facilities are unisex. There are also modified cubicles within the gents and ladies toilets. Bins for waste disposal are readily available in all exhibition halls used by the event. Everyone is welcome to attend VegfestUK events as a visitor, regardless of their current dietary, lifestyle, political of philosophical status. VegfestUK events welcome people who are vegan, transitioning, curious or completely new to the whole concept. People who currently choose to use animal products will be very welcome to attend and will be pleasantly surprised by the array of vegan options available. Many people go vegan after visiting our events, which is awesome. We do ask that visitors to VegfestUK events do not wear or use or consume any animal products when visiting the show. Please do not bring any of these to the event - your cooperation is much appreciated, thanks. Pets and other animals are not permitted on site due to health and safety reasons. However, assistance animals are welcome. During the show tenancy period, any items found will be handed to our security staff (location of Security Office TBC). Smoking is prohibited in all areas of the venue (this includes use of electronic cigarettes). Those who would like to film at the event must fill in the form here and return it to the venue at Fay.Pearson@olympia.london 1 week prior to the start of the event. Please note that only hand-held, battery-powered equipment may be used in the hall. Gangways must be clear of dollies, tripods, cables and any other accessories. No unruly or offensive behaviour will be tolerated at any time and the event management reserves the right to remove any such person who they deem to be using offensive language or behaviour. This particularly applies to anyone abusing or shouting at any of the event organisers, exhibitors, guests or venue staff.